Sign up Elizabeth for your organization today! REINVENT- Rediscover your Passion; Refuel your Purpose, Reset your Life shows you how to create you as you’ve always wanted to be. It is is the cornerstone of her keynote presentation and workshops. She is the ideal speaker for your conference or organization. She is a dynamic, energizing and passionate speaker. She uses the same dynamics for your organization as she does interviewing the stars. All of my coaching begins here withpowerful and thought-provoking questions about your life. I’ll offer tools and techniques to achieve breakthroughs that you can begin using immediately. Are you ready to BreakThroughYourWay™ more quickly? · (8) 30-minute touch base calls over the course of 2 months; 1 per week. · A written report of our work together will be provided to you within 1 week after the session is completed. 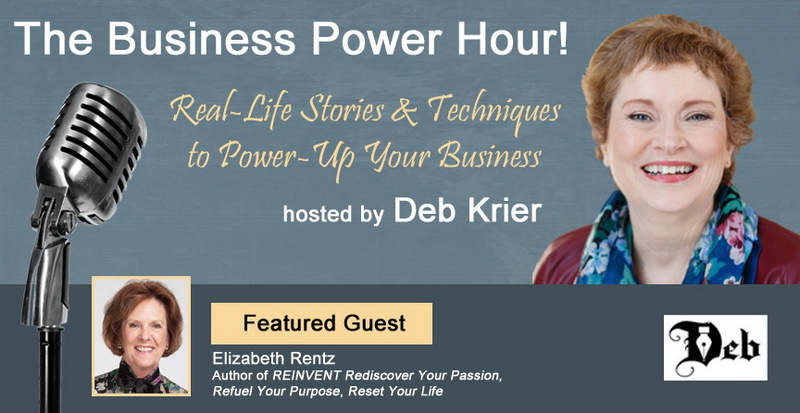 I am very excited to have the opportunity to write about Elizabeth and share my experiences with her as a very effective Life Coach. She has been an encouraging friend and confidant through extremely difficult and stressful times in my life. Elizabeth is a great listener. She has a levelheaded, soft-handed style in presenting suggestions, not necessarily to solve a problem but to open my mind to a realm of possibilities on how to view and address it. She has an energy that is contagious and makes you feel you can accomplish your goals with grace, harmony and balance with her as your coach!! Cindy H.
2 1/2 days to Create Your Compelling Future! Life is NOT A RACE! It is a journey and a process that is all about change and you are in charge, when you reach the final destination you die! Everything in life comes from movement and it’s up to you the direction you take. You have taken X amount of time to get where you are now. The question is: Are you where you want to be? OR are you searching for your highest potential? If you have decided to make a change in your life and create everything you have always wanted, THIS IS the workshop for you! 2. Develop strategies and skills to alleviate stress, achieve health and wellness while successfully attaining goals. 4. Develop clear goals of what you want in life and have ability to reframe your mindset from the inside out to BreakThrough Your Way™. You will build your compelling future! We will use tools and techniques perfected within Integrative Wellness & Life Coaching and NLP to resolve issues, remove negative strategies and take you to the next level!